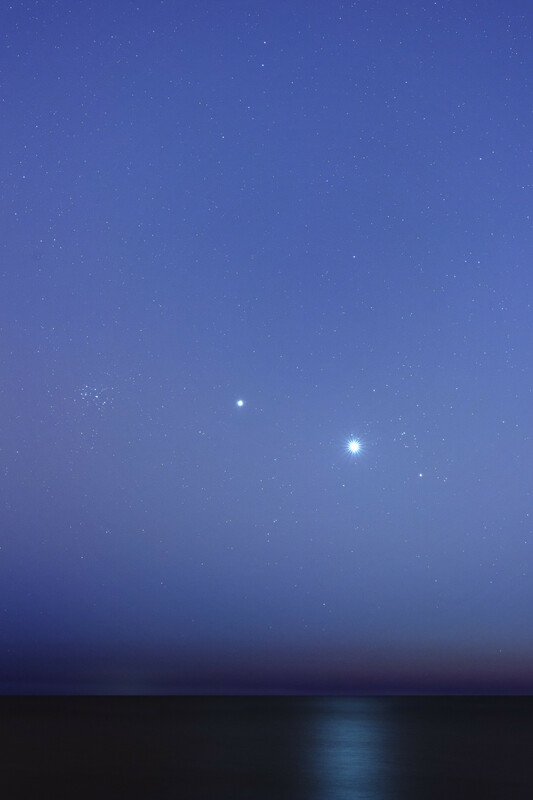 Explanation: Now shining in eastern skies at dawn, bright planets Venus and Jupiter join the Pleiades star cluster in this sea and sky scape, recorded earlier this week near Buenos Aires, Argentina. Venus dominates the scene that includes bright star Aldebaran just below and to the right. The planets are easy to spot for early morning risers, but this sky also holds two of our solar system's small worlds, Vesta and Ceres, not quite bright enough to be seen with the unaided eye. The digital camera's time exposure just captures them, though. Their positions are indicated when you put your cursor over the image. In orbit around Vesta, NASA's Dawn spacecraft arrived there last July, but is nearing the end of its visit to the main belt asteroid. In August, it will set off on its planned journey to Ceres, arriving at the dwarf planet in 2015.